With all the floods, power outages and rain, the usual LitCritters sessions are suspended until further notice (I just realized that I sounded like the Department of Education right there). Better to stay safe and read indoors for now. Just a quick note to remind you that you have one week to go before the deadline for submissions for Philippine Speculative Fiction V.
We're in the second of week of having no running water. And last night, we had no power. I hold fervently on to the hope that this too will pass. 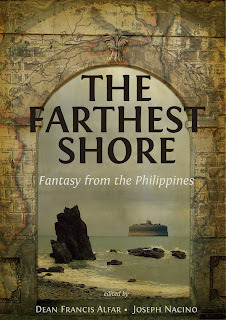 The Farthest Shore: An Anthology of Secondary World Fantasy from the Philippines is live and free for reading. Edited by Joseph Nacino and myself, the antho collects stories set in places other than the world we know.